University Hospitals are often battle grounds; each service trying to duck, dodge and weave their way around direct responsibility for any patients. It's in the name of the patient census, the numbers, the 'teaching', the fairness of the situation. It's in the name of all sorts of nonsense, but rarely (rare as in the limit of x as x approaches zero) is it in the name of patient care. Much of my training took place in just such a place where endless debates about whether a particular patient with pneumonia and diabetes belonged on respirology, or if the patient actually had diabetes and pneumonia and therefore should be admitted to the general medicine service took place. One night, while a junior resident on a general surgery rotation, I was asked by the doc in emerg to see a patient with abdominal pain. The exam, the labs and the imaging all added up to a diagnosis of choledocholithiasis. For those not initiated in the nuances of the multi-layered complexity of a university hospital it may seem to make sense that general surgeons, the surgeons who deal with the abdomen specifically, would be a good choice to take care of such a patient. The uninitiated might not know that an obstructing gallstone is a battleground, in fact the battleground, where general surgeons and gastroenterologists of the academic variety wage an ongoing war: A patient with a stuck gallstone needs 2 procedures, an ERCP to remove the offending stone, and a cholecystectomy to remove the offending gallbladder. The surgeons believe that since the ERCP needs to take place first the gastroenterologists should admit the patient (and therefore take primary responsibility for them), do their procedure and then consult the surgeons to remove the gallbladder. The gastroenterologists, on the other hand, believe that the surgery, being the bigger of the 2 procedures, should mean that the surgeons admit the patient (taking primary responsibility) and consult them to do ERCP prior to the surgery. The battle is waged daily (and nightly) in the emergency department, and although direct engagement between the primary adversaries (the two attending doctors) is rare, they freely dispatch their underlings to wage a war through proxy. When things look grim and a patient might actually be admitted one of these great generals might even phone down to the emerg to chew out the emerg doc in an effort to restore a more favourable balance to the conflict. The causes of the ongoing conflict are many. People are overworked, overstretched, tired, angry and hungry. The residents, foot soldiers in the conflict, are indoctrinated in the importance of being a wall, protecting the service from admissions and keeping the census low. After seeing the patient I prepared for the buff and turf. I arranged my arguments and evidence like a row of grenades and called my general for the final battle orders. I've got a patient down here in emerg., consulted for abdo pain but turns out to have an obstructing gallstone. I'm going to call GI and try to get them to do the admit. I'd been through the battle before, I knew this was how it was all supposed to go. On the other end of the phone I heard only a moment of silence, and then a slightly confused Why? ... I'll come down in a couple of minutes and see the patient with you. The general surgeon working that night happened to be a particular human and humane man. He saw the patient, agreed with the diagnosis, agreed with the treatment, but disagreed with the disposition. Why would we get someone else to do the admission? The emerg asked us to see the person, to help them. How does it help the patient to see a whole other team of people and to sit here in emerg for another 3 or 4 hours all just so we can have one less person on our service? His point was well taken, the real question was more about the patient in front of us than with the politics of the place she was in. In actual fact it typically took less time and effort for both us and the patient to simply do the admission than to wage the ongoing war. In rural medicine I don't have to deal with these issues in my own hospital. If I'm working in the emerg and want to admit to someone I just do it, admitting them to myself and caring for them in hospital. Occasionally I face these roadblocks when I'm trying to get assistance over the phone, or to transfer a patient. Should a trauma patient with altered level of consciousness go to neurosurgery, emergency or ICU, when they're transfered to the University Hospital? The reality is that what the patient really need is to get to the next level of care, under whom they are admitted is likely of limited importance (since all these players will be involved in their care regardless). I find the human approach (an appeal on alternate grounds) is best, since the politics run too deep for an outsider to get embroiled in. The patient is sick, I say, I'm in the middle of nowhere and I don't have a CT scanner, a neurosurgeon, or an actual ICU. I need to transfer this patient to you because I've done everything I can here and it's not enough, so I'm asking for your help. The north is usually portrayed as cold, snow-covered, desolate and barren. But while the summer here is short, it is a season full of beauty and life. The tundra, drifted over all winter with snow and ice, turns green and red and purple and yellow. A symphony of colour unleashes itself in a short carpet of wildflowers that covers everything. 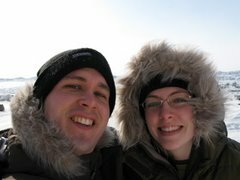 Dr. H and I arrived here in Iqaluit almost 2 weeks ago. It's been very busy, interesting, and often fun. We've been working a great deal, but did have time to take a break and go walk among the endless tiny flowers that cover the summer landscape. Here are a few pictures from our walk. A northern mosquito makes a feast of my finger (the things I'll do for a picture!). A ship unloads it's supplies in the harbor. Notice there is still ice in the water, and even today I noticed a few lingering pieces. There are no roads into Iqaluit and in general all goods are flown in at great cost. The short summer shipping season offers a chance to bring in goods at much reduces prices. In addition to dry goods, and general supplies, ships bring in vehicles, heavy equipment, fuel, and all the supplies for building any new buildings. Tiny flowers cover the ground. The row of look-alike houses leading towards our place. Locally these houses are sometimes referred to as 'lego-land'. I can't believe we've been here for only about a week, because it already feels like a month (or two). It's been exciting, scary, fun and, at times, downright bizarre. - Had the best waffle of my life. That's right. You heard me. If there's one thing this town is not lacking, it's delicious waffles. Here's a picture from a walk Aaron and I took right near our place. There's a little inushuk (the Inuit spelling is more like inuksuk) on the rock at the top of the hill. I like teaching medical students and residents. Some parts I'm good at; in particular I like to think I'm good at teaching people how to approach problems in a logical way, how to cope with incomplete diagnostic information, and how to deal with the (at times overwhelming) vagueness of family medicine. Some parts I struggle with. Teaching technical skills is one of those areas. I try to show students, step by step, guiding their hands as best I can (when the situation is non-emergent), but I'm sure I still fall short. As a resident I had some brilliant teachers who could describe the performance of technical procedures in exquisitely simple language, knowledge flowed from their mouth into my hands....alas, I impart no such skill to the students I encounter. We finally made it to Iqaluit after 5 days of frantic packing, 2 flights and 3 hotel stays. It's been a long week and it's still not over yet! We are still living out of our suitcases but we're loving the apartment we're renting here. It's bigger than our old apartment, and the layout is much more appealing. The rents are quite high (we're paying more than we were in the city) and the houses are all extremely functional; in the minus 40 weather there is no place for esthetics, it's all about staying warm and making it through the winter. Right now the weather is actually quite nice...the highs are between around 5 and 10 degrees Celsius, and apart from a bit of rain, it's been pretty clear. The weather is funny...you can literally see the fog rolling in and out of the bay. There is a stark beauty to this place and the walk to the hospital in the mornings is really stunning. I am doing anesthesia in the mornings and clinics in the afternoons. Aaron has done some emerg shifts and is getting organized on some projects he'll be working on up here over the year. I have to admit it, I am totally exhausted. Mental overload. I think I feel more comfortable in the operating room than I do in the family medicine clinic. I guess I am just used to having my little spot in the OR with all my familiar drugs and airway equipment and my monitors. The clinic is a completely different beast and I'm a bit overwhelmed by the breadth of stuff that comes in. To any specialist who has ever maligned a family doc, I challenge you to spend a week (or a day...or even an hour) in a family practice and ever feel justified in bad-mouthing a family doctor again. Luckily, everyone at the hospital has been absolutely lovely and helpful and welcoming. We've been too busy to take any pictures but I'm sure there will be many posted here soon (along with some insightful comments from Aaron). For tonight, I'm going to make some dinner and then retreat to the bedroom with the tinfoil-covered window (to keep out the midnight sun) for some sleep, and get up and do it all over again tomorrow. Last week Dr. H and I travelled to Calgary for the Canadian anesthesiology conference, and to visit her parents before we head up north. While we were there we decided to take a trip to Alberta's badlands. Not being from the praries I had always assumed that the landscape was rather flat until you got into the foothills of the Rockies. Not so... The Badlands have really interesting geography and are anything but flat. On our day trip we went to the town of Drumheller, the Royal Tyrell Museum (a great dinosaur museum! ), and did a driving tour of the Badlands, stopping at several canyons, a suspension bridge, a ferry, and hoodoos. After a long day we headed back to Calgary and experienced a June Alberta snowstorm, out of nowhere 1 km of the highway and surounding fields was covered by 6 inches of snow. 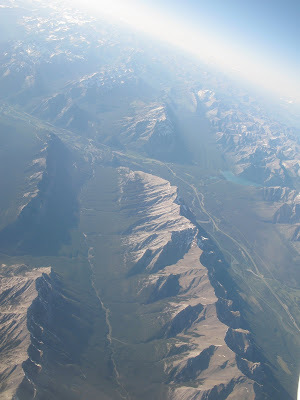 A view of the western side of the Rockies. Drumheller is home to "THE WORLD'S LARGEST DINOSAUR!!! ", and here's Dr. H on his foot. A prairie dog poses for the camera.